GARY Caldwell hailed Wigan Athletic’s ‘character, strength and resilience’ in recovering from the blow of losing a two-goal lead at Peterborough to force a late winner. Goals from Yanic Wildschut and Will Grigg had given Latics a comfortable lead at the halfway point. But the home side pulled one back on the hour mark, and forced a dramatic equaliser with 10 minutes remaining. However, virtually from the kick-off, Latics went up the other end and Max Power drilled a superb shot into the bottom corner to secure all three points. “Every game involving Wigan Athletic is eventful at the moment,” acknowledged Caldwell. “Overall I’m delighted with a fantastic win on the back of Saturday. To come away from home and perform, in the early stages, as we wanted to was great. “We struggled to contain the game after that and allowed them back into it. 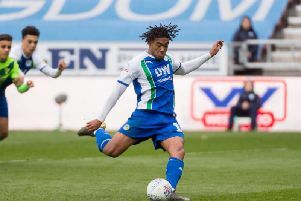 The Latics chief felt his side’s inability to put the game to bed, as well as another somewhat shaky night at the back, were the only downsides. Indeed, Posh looked the team most likely to win it after restoring parity, before Power surged forward to break their hearts. “We were under pressure at the point, yes,” recognised Caldwell. “The first part of the second half was our best spell of the game, and we should have finished it off at 3-0. “If they score, we know we’re going to put ourselves under pressure - and they did. “But to come back in the manner we did, so soon after they’d scored the equaliser, was fantastic. “We’ve looked a real threat going forward of late, and that’s been a real positive in our play.